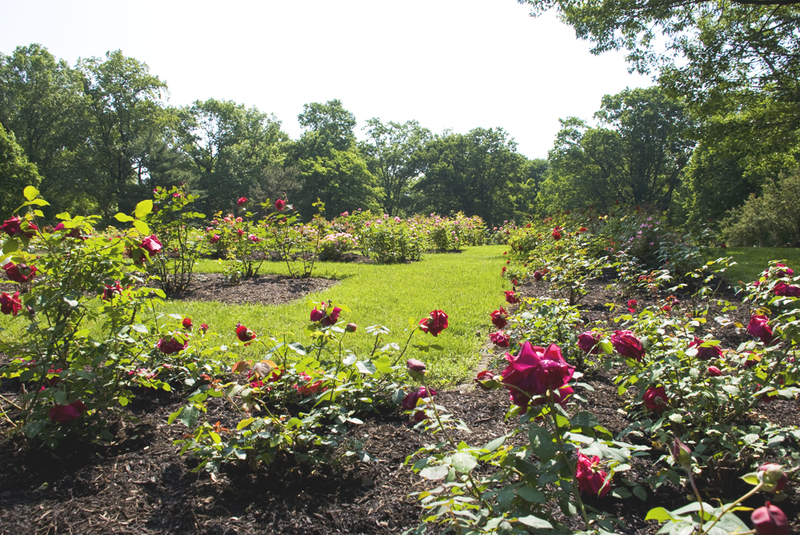 The Essex County Rose Garden at Brookdale Park was established in June 1959 through a joint effort of the New Jersey Rose Society and the Essex County Parks Department. The initial collection started with 650 rose bushes including 80 different varieties. Care and restoration of the Brookdale Rose Garden was taken over in 1997, as a community project by the newly formed Rutgers Master Gardeners of Essex County (RMGEC). The garden continues to thrive today and has grown to 15,000 square feet divided up into 29 separate beds of hybrid tea, floribunda, shrub, hybrid musk, polyanthas, rugosas and antique roses. It includes 1,500 bushes of over 100 varieties. Roses have been selected for their disease resistance, color, fragrance and blooms throughout the growing season. The success of garden is due to the leadership of past and current Master Gardeners Jonathan Forsell (1997- 2000), Bob Kroeckel (2003-2006) and Susan Jankolovits (2006 to present) as well as the ongoing support of the Essex County Department of Parks, Recreation and Cultural Affairs. RMGEC and other community volunteers meet every Thursday morning from mid-March thru November to keep the the Rose Garden looking its best. Drastic pruning, fertilizing, herbicide application and weeding are performed in early spring while throughout the summer, mulching, watering and weeding takes place around the beds. A balanced rose fertilizer is used twice a season and granular Epsom salt is applied to each rosebush several times a season. Granulated lime is judiciously applied every autumn to counteract the high soil pH caused by air pollution. All weeding is done mechanically rather than with the use ofherbicides and there is no use of fungicide at all. Rutgers Master Gardeners of Essex County, The Brookdale Park Rose Garden Committee was formed to restore and revitalize the Rose Garden of the Essex County Parks System for the enjoyment of all visitors to Brookdale Park in Bloomfield and Montclair, New Jersey. The committee also educates the Master Gardeners and the visitors to the Garden in the care and maintenance of Roses. For more information on Rutgers Master Gardeners of Essex County, the Brookdale Park Rose Garden Committee and the Essex County Rose Garden at Brookdale Park, please visit www.MGEssex.org. To volunteer or make a monetary donation to the Rose Garden, please contact Susan Jankolovits via email.